The picture blog Awkward Family Photos is a source of daily joy to me and this single image should demonstrate why. 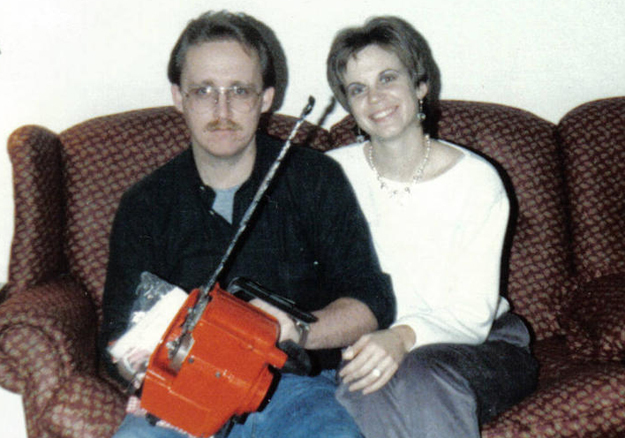 You can see at a glance that this man loves his chainsaw way, way more than he loves his wife. He could have ruined the whole thing by smiling, as he was no doubt instructed to do, but he resolutely stuck by his first choice, the steely grimace. His mysteriously ginger moustache is just icing on the cake. I feel sure that this shot was Exhibit A in a trial at some point and can only hope that it was of the divorce variety, and not murder.